Every new production cycle begins with discarding the “unproﬁtable” individuals. From factory farms, to free-range and organic farms, to family farms and backyard operations, the same rule of proﬁt applies: as soon as an animal is deemed “unproﬁtable”, he or she is killed. This sorting process begins with each new batch of newborns, and continues throughout the short life of each new ﬂock or herd. Egg production begins with the mass killing of roosters (male chicks). Because they can’t lay eggs, roosters are useless to the egg producer and are killed shortly after hatching. Every year, 200 million male chicks are killed in American hatcheries by suffocation or maceration (being ground up alive). Virtually all hens used in all forms of egg production, from “free range”, to large scale, to backyard farms, come from hatcheries that kill all of the male chicks. Farmers who hatch their own chicks kill the roosters on the farm. • Excess” turkey and “broiler” chicks are killed at the hatchery before they even make it to the “grow out” facility. • The “runt” piglets of each new litter are killed. PAC (Pounding Against Concrete) is a common practice that involves workers holding the piglets by their hind legs and smashing their heads against the ﬂoor. Dairy production.begins with the killing of male babies. Because males do not produce milk, they are useless to the dairy farmer and they are ripped from their grieving mothers shortly after birth. Infant males along with any “excess” females are either killed on the ﬁrst few days of their lives, or they are sold to slaughterhouses after being fattened, in isolation from their mothers, for 4-6 months. Meat production begins with the killing of “unproﬁtable” infants. Hatcheries throw millions of “surplus” and “defective” “broiler” chicks, turkey poults, and ducklings into the same dumpsters as the discarded egg shells they emerged from hours earlier. Hog farmers routinely kill the smallest piglets of each new litter at one or two days old, because these “runts” are considered unlikely to reach “market weight” by the desired slaughter date. Sick or injured animals are killed at any time before shipment to slaughter because it’s cheaper to “cull” them than it is to treat them. The same proﬁt calculations govern the lives of all animals exploited for their ﬂesh, milk, eggs, wool, skin or feathers, on small and large farms alike. If the animal doesn’t have a proﬁtable “Feed Conversion Ratio” (the ability to produce the expected amount of ﬂesh, eggs, milk, or wool with the smallest amount of feed investment possible), they are discarded by the most inexpensive means possible. 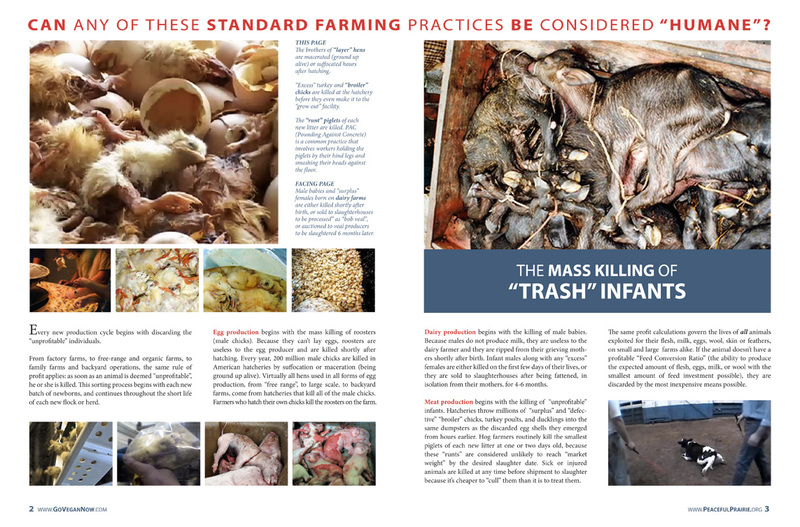 • Male babies and “surplus” females born on dairy farms are either killed shortly after birth, or sold to slaughterhouses to be processed” as “bob veal”, or auctioned to veal producers to be slaughtered 6 months later.